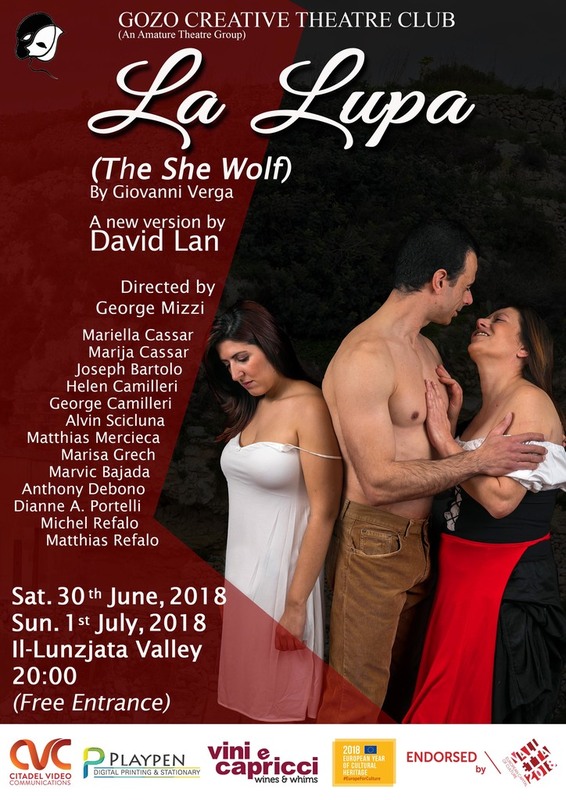 The Gozo Creative Theatre Club’s project is to stage Giovanni Verga’s masterpiece play “La Lupa” translated in English language, a new version by David Lan for the Royal Shakespeare Company. This is planned to be held at the remote, rustic and magnificent location of Wied il-Lunzjata in Victoria, Gozo, with local actors, dancers and musicians taking part. This compelling drama starts with jolly dancing and singing and slowly builds tension by gradually developing into a battle of wills for the three main characters: Nanni, Pina and Mara, fighting their Christian beliefs along with their temptations, culminating in a decisive ending. Nanni, a man who is bewitched with Pina, also desires her daughter Mara, thus consuming himself and those close to him. Mara does not want Nanni at first however grows to love him resulting in her disowning her mother thus escalating her mother’s decent into madness. As partnership between the Gozo Creative Theatre Club and Tal-Fuklar Folk Group. In collaboration with Gozo Cultural Office, Gozo College Education Department, Ambassador & Permanent Delegate Of Malta To UNESCO and endorsed by Valletta 2018 Foundation.